Leading Distributor / Channel Partner of zinc aluminum spray, six in one spray, silicon spray, plastic mould release and anti spatter spray, high performance welder anti spatter spray, online contact cleaner and conformal coating and plastic coating from Delhi. Wonder zinc alum. Spray is a high-brilliance, anti corrosive surface coating for repair of galvanized substrates damage during welding/fabrication. The special formulation and highest purity of the metal pigments employed create an extremely high gloss finish. This gives a dry sacrificial cathodic zinc coating on metals with the bright finish of hot dip gal vanishing. Its zinc rich formula provides long lasting protection. Dry to touch: 15-20 Min. Fully cured: After 6-8 hrs. Can be painted over: After 6-8 hrs. Solubility in Solvent : Soluble in Keaton's/Esters. Highly versatile mold release for those who require the best. Blend of low & high viscosity silicone fluids. Ideal for both hot & cold molds. Description Prevents Spatter From Adhering To Weld Beads Surrounding Metal Surfaces & Welding Tips During Welding. Characteristics And Properties Excellent Long Term Effect Of Preventing Weld-spatter-remains Effective Even After 1 Month No Offensive Smell. Inert Colorless Non-toxic & Clean Working Condition. Fast Drying. 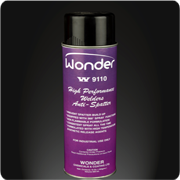 Heavy Duty-effective Even On The Most Severe High Amperage Weld Spattering, Unlike Normal Anti- Spatter Sprays. Fully Non-flammable Formulation With A Non-flammable Co2 Propellant For Higher User Safety As Well As Higher Actual Coverage (97% Actives Vs 65% Max Actives In Hydrocarbon Propelled Aerosol Sprays). Superior Application And Durability. No Adverse Affect On Type Of Welding. Keeps Tips And Nozzles Clean. Prevents Spatter Build-up. Designed for the safe & effective "On-Line" cleaning of light medium soils, from electro mechanical assemblies without adversely affecting most sensitive plastics & elastomers contactors, switches, relay's, solenoids, electric motors, connectors, capacitors. 360° Spray action for maximum convenience of use. 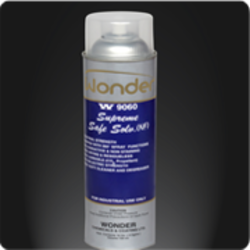 Mild solvents, Safe for "On-Line" cleaning of metals & most sensitive plastics and elastomers. High surface wetting with controlled evaporation. No CFC's. Ozone friendly formulation. Economical, high quality choice for "On-Line?? Cleaning of electrical equipments. Appearance : Satisfactory, no whitish spots and blistering observed. Fast drying, non flammable, ultra high strength "on line" dielectric contact cleaner. This fast-drying, nonflammable, no flash point, non-corrosive product dissolves grease fast leaving surfaces clean and dry with no residue. Safe for use on most metals. Do not use on plastics". 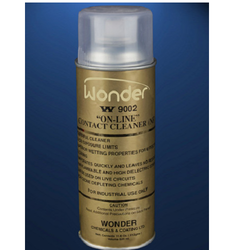 Wonder Safety Solvent is a powerful cleaner that quickly removes grease deposits, oil, metallic particles, carbon dust and other contaminants without requiring neutralization. Because this product is non-conductive it may be used on warm motors in place. 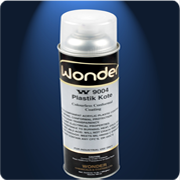 Ideal for removing spots and fingerprints due to strength of solvents. Test on painted surfaces prior to use. Effectively removes grease, oil, dirt and other contaminants. Low surface tension allows for easy penetration and eliminates the need for dis-assembly of component parts. Restores and maintains original electrical values and constants. Fast evaporation, does not leave residue. Clean warm motors in place. Non-flammable ozone friendly, CO2 propellant. Enhanced user & environment safety. Unique atomization & surface wetting action for unmatched cleaning power. Controlled evaporation (2.6) for better penetration & cleaning power. Ultra high dielectric strength (36 KV). 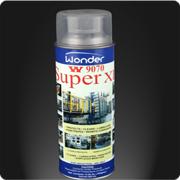 Wonder super XL is plastic safe high di-electric strength cleaner, lubricant, moisture displacer, penetrant & corrosion inhibitor that loosens dirt, scale, rust, Reopens jammed assemblies, cleans grease/grime and prevents electrical malfunctions caused by water penetration, humidity, condensation or corrosion. Protects against rust & corrosion. Fills microscopic irregularities on the surface & forms a protective barrier against corrosion & moisture damage. Dielectric strength- 47KV. Instantly improves electrical properties & enables equipment operation. Quick action, deep penetrative cleaner- quickly loosens dirt, scale, rust, re-opens jammed assemblies & cleans grease, grime. Displaces moisture. Dries out wet electrical systems & ignitions. Cleans & decreases. Penetrates dirt, grime, grease ,dissolves adhesives. Contact lubricant improves current flow. Excellent dielectric non-greasy, silicone free long lasting lubricant especially designed for the lubrication & protection of precision machinery, electrical systems especially those situated in damp & corrosive situation caused by high humidity, acids and alkali laden conditions. Strongly removes greases oil, dirt and contaminants. Extra Low surface tension products for easy cleaning of parts. Tri clean maintains proper electrical values. An ideal product for the sage and effective cleaning of high tech electronic hardware, PCBs and PWBs. It is safe for use on metal plastic, rubber and glass surface. Safe on plastics and metals. Fast penetrating action and residueless effectively removes grease, oil, dirt and other contaminants includes extension tube for precision application. Doesn't contain CFCs, HCFCs or chlorinated solvents. Unique wetting action cleans the finest of instruments, contracts, relays, precision mechanical or electrical solenoids and other delicate hardware. Ozone friendly, C02 propellant enhanced and environment safety. Looking for Aerosole Spray MRO Products Industrial Spray ?